I had a trip down to the Welcome Collection over the weekend to see the new exhibition Dirt. After my last trip there i had high expectations, as I'm always impressed with the diversity of the artefact's on display. As you walk around the show, the emphasis and focus constantly shifts and changes, giving you a much broader view of the subject matter. Highlight of this show were James Croak's cast dirt window, the 19th Century etchings illustrating various Cholera preventative costumes, and the wonderful 1661 'Momento Mori' tin glazed earthenware plate, with the inscription "You and I are earth". The exhibition runs until 31st August so there is still plenty of time to see it. 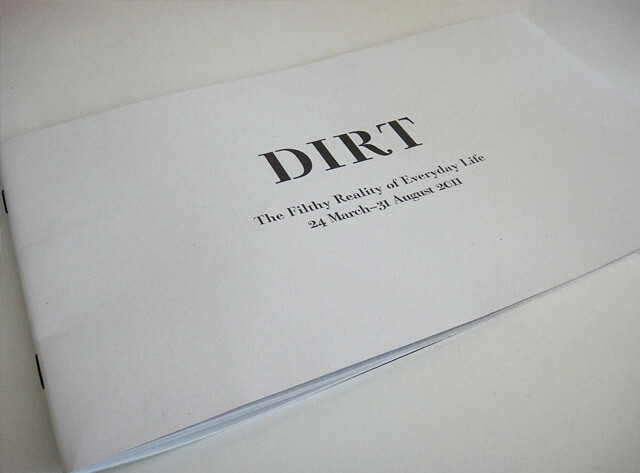 Also if you want to contribute, there is a 'Filthy Flickr Pool' where you can join and upload your own photos of dirt.